Liquid nitrogen and dry ice were just some of the ingredients for the‘Really Cool Chemistry’ show hosted by the University of Ulster in partnership withthe Royal Society of Chemistry (RSC) at the university’s Jordanstown campus. 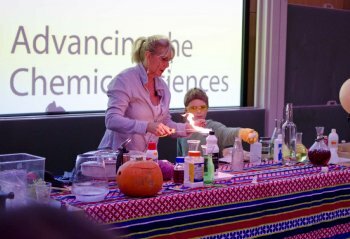 Around 200 youngsters and their parents watched in awe as Science Magician Sue McGrath and the brave volunteers carried outsome chillingexperiments to reveal the wonders and magic of chemistry. The free family event was the latest in a series of interactive scienceshowshostedby the university to bringscience to life foryoungchildren by making it fun. Event organiser Dr Tony Byrne, a Reader in Ulster’s School of Engineering and Chairperson of the RSC’s NI Section,was delighted with the success of the event which hehopedwould inspire some of the youngsters to become scientists. “The Really Cool Chemistry show was completelybookedout within a week ofit beingadvertised," he said. "Children are reallyenthusiastic about science when it is presented in a fun way and we can only hope that this willhelp encouragesome ofthem to become scientists of the future.